This plug-in presents info about the currently selected antenna. It has four tabs with General Information, Pattern diagram, Technical specifications and visual image. This plug-in will be enhanced with different features such as "Rotating Pattern" etc as upgrades. All upgrades are included for free when you invest in this versatile and useful plug-in. 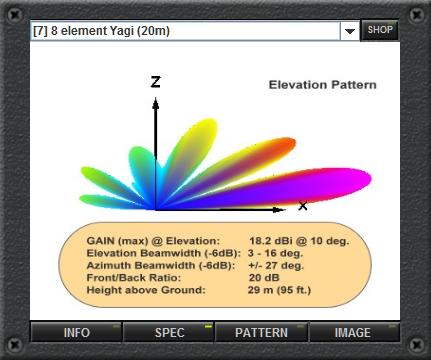 The Antenna Info plug-in will give you info about all our antennas and not just the ones you own. Just select the antenna you are interested in from the drop-down selector. The Antenna information/specification database is supporting a majority of our antennas, however there is still some antenna info that needs to be added. We are working on completing the database in a few weeks.